And yet, there is so much else that you can enjoy on this Thanksgiving Weekend in the Big Apple! Shopping in New York City on Black Friday is a unique experience, not counting the great deals to be had. And then, there’s Broadway shows, Radio City Christmas Spectacular, The Nutcracker Ballet at Lincoln Center, the Winter Village at Bryant Park, and let’s not forget Rockefeller Center. Here you can ice skate, enjoy Christmas lights and get a glimpse of the Christmas tree, while not let lit, still a sight to see. Did we mention our hale, The Sheraton New York Times Square! Talk about location, step out the front door, turn one way and there’s Times Square and Broadway, turn the other and it’s a short walk to Central Park, the 5th Ave. shops and Rockefeller Center. 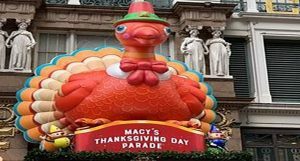 The Macy’s Day Parade route is just up the street. SO ONO! Round trip airfare from Honolulu to New York (JFK) via Hawaiian Airlines. Reserve with a $200 non-refundable deposit per person. Final payment is due by September 20th. Package is non-refundable after this date. 11/25/19 – Depart Honolulu on Hawaiian Airlines flight 50 at 4:25 pm and arrive in New York (JFK) at 6:55 am, 11/26/19. 12/01/19 – Depart New York (JFK) on Hawaiian Airlines flight 51 at 10:00 am and arrive in Honolulu at 4:30 pm.